As a kid, Eiji Morishita felt different from the other kids. He was the first child in his family to be born in the US, not speaking English until he was 5. Ridiculed for bringing bento boxes instead of the sandwiches all the other kids had, he would eat alone. Kids often made fun of his name, exacerbated by a substitute teacher who completely butchered it, with all the kids laughing. It was bad enough that he considered changing his name to John while in college. He spent a great deal of time as a kid in the restaurant his great grandparents had started, that his parents now owned. Initially, the restaurant clientele was just Japanese people, then non-Japanese starting coming to eat sushi, beginning with creatives and artists like Shirley MacLaine and William Shatner. When he was waiting tables in Jr. High at Santa Monica Place, they started serving hipsters dressed in Miami Vice outfits, as well as some local professional athletes. Once sushi’s popularity picked up steam, the violent opposition phase came, with news media questioning the health risks of serving raw fish and mercury poisoning. In 2004, his family opened two restaurants at the same time. His parents asked him to move back to LA to help them run the restaurants. At first, they really struggled with the competition of thousands of sushi restaurants in LA. His parents were losing $10K-$20K per month, depending on the month. So he interviewed his family, learning their story. That’s when they realized they were pioneers in the sushi industry. They positioned themselves as America’s First Family of Sushi and garnered press from LA, NY Times and ABC News. The added exposure got critics to check out and review them, which led to winning several awards for Best Sushi and Pioneer Award from the State of California. The exposure took them from $460K to $1.2M in less than two years, securing Eiji’s parents’ retirement. For the last seven years, Eiji, a/k/a “The Authority Genius” and founder of the Genius Millionaire Academy, has been running Movement Makers which is a training company that works with entrepreneurs on building and scaling their businesses, as well as developing their leadership skills. His current focus is to establish Movement Makers as the #1 training organization for empowering entrepreneurs and leaders to launch movements that impact millions of lives. Movement Makers is currently working on several movements in health, job training, emergency preparedness, satellite communications, veterans transition, and STEM. 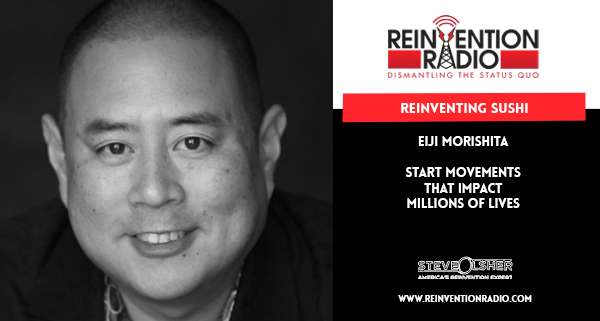 TUNE IN to this episode as Eiji chats with Steve, Mary and Richard chat about his family, and how he helps empower leaders to start movements that impact millions of lives. Reinventing the Culinary World – In this episode, Chef Charles Carroll chats with Steve, Mary and Richard chat with Chef Carroll about the ingredients of greatness and finding the time to be great.